This package saves $165 off the standard individual inspection rates. Significant cracks or leaning in walls. Cracks and other defects in floors. Movement, sagging or any structural defects in the roof structure. Unsound modifications that have been made to the roof structure. Moisture issues such as rising damp, significant leaks in the roof, leaking shower recesses. Condition of external structures such as sheds, pergolas, fences & retaining walls. The condition of flashings and gutters. A detailed assessment of the condition of ceilings. General plumbing checks including taps, toilets and installation defects. General testing of lights and ceiling fans. Basic testing of appliances: oven, hotplate & rangehood. Basic testing of air conditioning. Silicone sealing and waterproofing to wet areas. Degradation of external painting where structural elements are affected. The general condition of cabinetry. A list of areas suspected of containing asbestos on the premises. A more detailed assessment of the condition of fences. Pool safety inspection: including the condition of pool fences and self-closing gates to enclosed water bodies. Ventilation of internal gas bayonets. Your Building Inspector is a registered builder with 20 years of experience in the building industry in WA. The inspector is not an electrician or plumber, so in order to only provide professional advice; it is not possible for us to offer a technical assessment of certain items like ovens, air conditioners, swimming pool pumps etc. If you have any questions on what is or isn’t included, please don’t hesitate to call Jon on 0420 846 356. Live termites found inside the home. Live termites found near the home such as tree stumps in the garden. Other timber pests such as European Borer, fungus etc which can also be found in WA. Any previous damage caused by the above. These pests can attack timber and cause structural defects in the home and for this reason, financial institutions often require this as a condition of finance. The report is done in accordance with the Australian Standard AS4349.3 and includes a visual Termite Inspection of accessible areas. Further inspections or treatments may be recommended if deemed appropriate. These safety checks are included with any Building Inspections Package. The Building Inspector will check the meter box for 2 x RCDs, which is state legislation for people selling homes in WA. There is also a DFES requirement for hardwired smoke detectors less than 10 years of age to be installed in proximity to all bedrooms in any home being sold. Your Prompt Building Inspector in Perth, WA is equipped with State of the art Thermal imaging equipment. This equipment uses infra red to detect temperature variations in different surfaces. 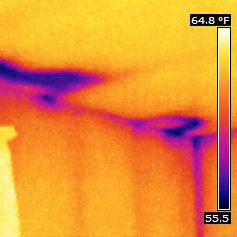 Leaks in the roof, moisture ingress, major gaps in insulation and other issues can be detected by identifying variance in the surface temperature of various building elements. The Thermal imager makes this easier by giving a visual indication of hot and cold spots on walls, ceilings and other surfaces. 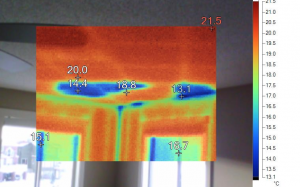 Use of the Thermal imager is at inspector’s discretion and no guarantees are offered that the inspection will uncover anything more than a standard visual inspection. Assisting owner builders with advice as needed. Dispute resolution with trades during renovations or home improvements. Assessment of any structural issues that can arise in a home such as dampness in walls, sagging ceilings, cracks in walls, etc. Assessing concerns clients may have over quality on new homes under construction and renovations being done by a builder. If you have any queries at all regarding the Home Inspection Services that Prompt can provide, please don’t hesitate to call Jon on 0420 846 356 or email me on [email protected]. Room measurements as per plans. The majority of the dimensions will be measured on site and compared with the plans for discrepancies. Any differences that are outside of tolerances will be reported on. Installation of cavity flashings in required areas. Installation of wire ties including corrosion resistance level near the coast. Straightness, true and plumb of window and door frames. General squareness of rooms, mainly focusing on smaller rooms such as wet areas where out of squareness will result in difficulty with tiling. Installation of structural columns as per engineer’s details. Quality of appearance of face brickwork. On a single-storey home in WA we will often carry out an inspection of the roof frame at the same time as the Plate Height Building Inspection. Generally, the roof is completed fairly quickly after the home reaches plate height. This inspection includes a detailed assessment of all roof framing elements in accordance with AS1684.4 and any roofing notes included in the engineer’s details. We will also inspect tie-down straps and connections and anything else that is relevant to this stage of construction such as pergola post footings, fire blankets, flashings, tie-down rods etc. It is best to do an inspection of the roof before the ceilings are installed as this is when visibility and access is easiest, also some builders do not allow inspectors to enter the roof cavity at PCI. Overall painting quality including paint runs, inadequate sanding/prep, incomplete painting etc. Quality of ceilings including neatness of joins, cornices, sanding & painting. Plastering finish including window surrounds, wall surfaces, straightness of corner beads etc. Quality of ceramic tiling including appropriate layout, lipping, fall towards shower wastes and general appearance. Waterproofing and silicone sealant to wet areas. General Inspection of appliances such as oven, hotplate, air conditioner & hot water unit. General Inspection of plumbing fixtures such as bath, toilets for correct installation. Checking of window frames for scratches, dents etc. Correct hanging of doors and other carpentry items. Paving or exterior concrete for quality and finish. Connection of flume ducting to roof vents. Assessment of vanadium staining of face brickwork. Overall this inspection is designed to assist clients in achieving a smooth handover and offer non-biased, professional advice on the condition of the home. This can often alleviate tension between client and builder as an independent inspector is going to give professional advice on any queries or complaints that may arise.